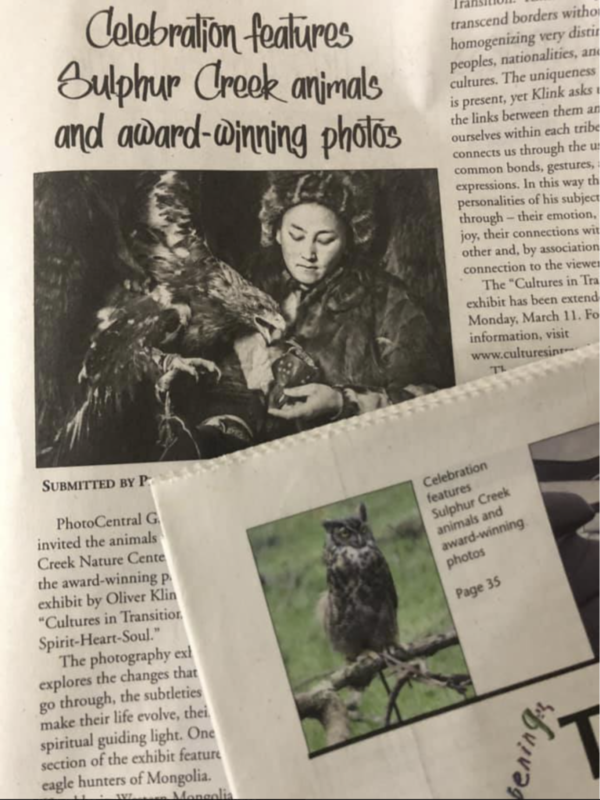 PhotoCentral Gallery has invited the animals of Sulphur Creek Nature Center to celebrate the award winning photography exhibit by Oliver Klink, Cultures in Transition: Spirit-Heart-Soul. 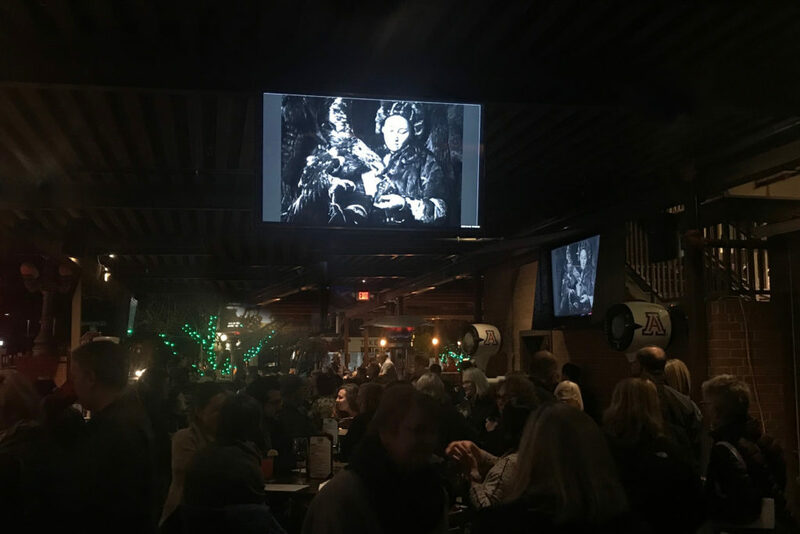 The photography exhibit explores the changes that people go through, the subtleties that make their life evolve, their spiritual guiding light. One section of the exhibit features the eagle hunters of Mongolia. Kazakhs in Western Mongolia have mastered the ancient and noble art of hunting with eagles. As nomadic tribes, their survival depends on training these majestic birds and passing on their skills to the younger generation. For centuries, this knowledge has been transferred from father to son, now father to daughter. Sulphur Creek Nature Center will showcase their rescued animals. The parallel between the eagle hunters and the work done at Sulphur Creek Nature Center is commanding. Both outfit really cares for the animals and their release to the wild. An event not to be missed to hear about the mission of Sulphur Creek Nature Center. 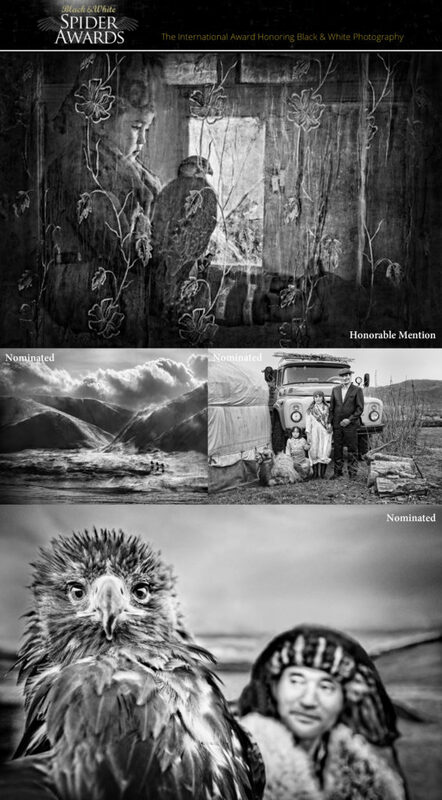 Black & White is the ultimate resource for connoisseurs and collectors of black and white fine-art photography. 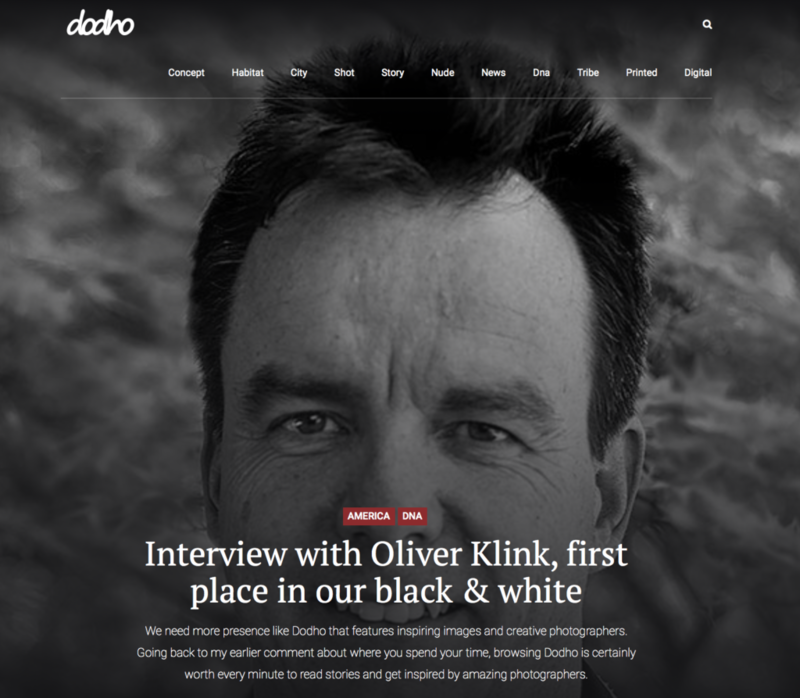 The magazine awarded Klink with an award for four of his images at the Single Contest. Black & White was welcomed by the photographic community from its first issue and its circulation has expanded around the world. While black and white photography is often thought of as a medium of the past, recent years have drawn more enthusiasts into its community, with many participants using digital-format cameras to create black and white images. We believe that the popularity of Black & White has been a factor in the accelerated growth of this medium and will continue to be a major factor in its continued popularity. 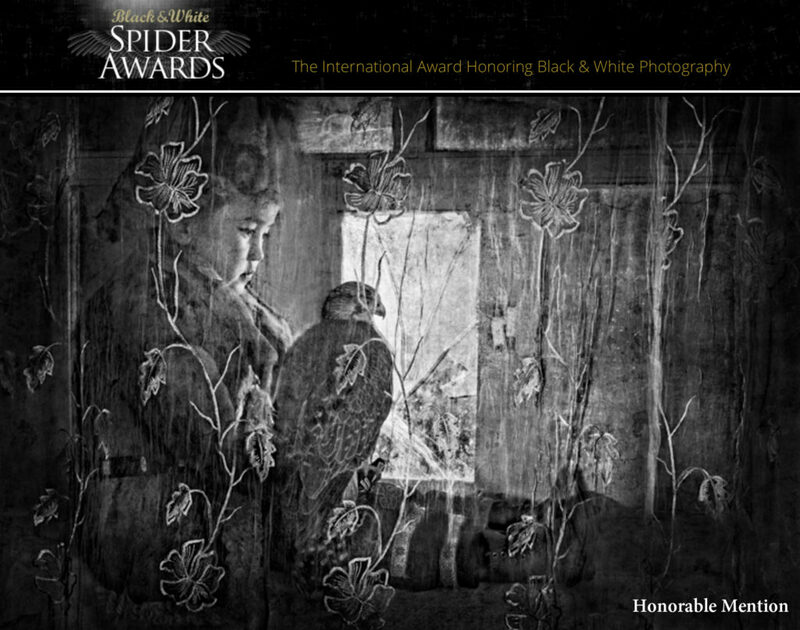 Klink was honored to receive 4 nominations at the leading international award honoring B&W photography. 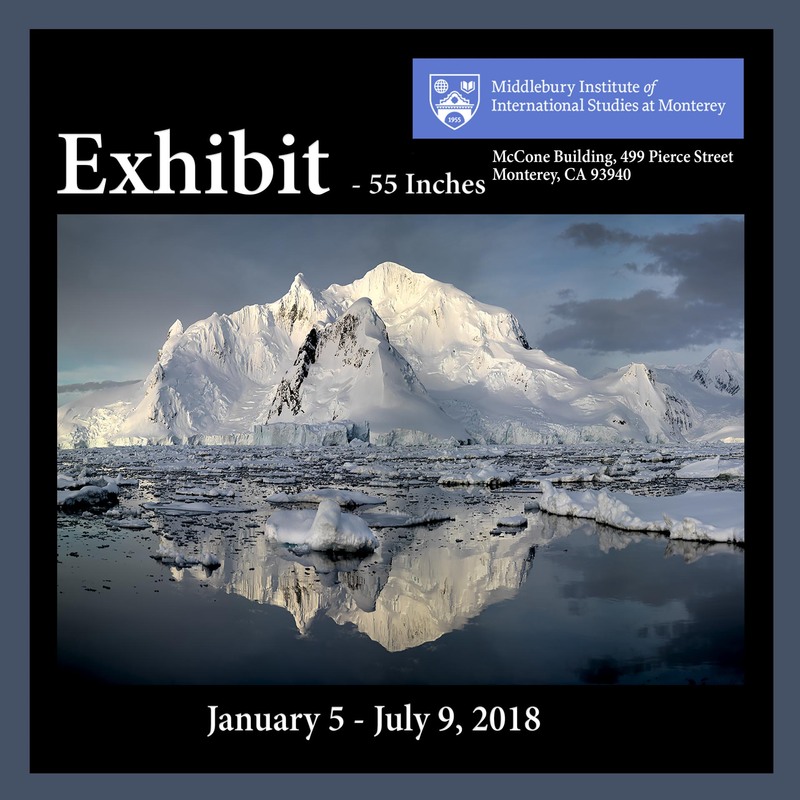 The celebrated event shines a spotlight on the best professional and amateur photographers in a prestigious annual competition and globally webcast photo show. I was born and raised in Switzerland. I was educated in three different countries (Switzerland, Canada, USA), got a Master in Physics, Master in Business and studies in photography. Photography was always a passion and it eventually turned into a profession (www.incredibletravelphotos.com, www.oliverklinkphotography.com, www.culturesintransition.com). I travel the world (photographed in 116 countries) to capture the intricacy of the world we inhabit and to teach photographers to make images that have a personal flair. PechaKucha (Japanese: ぺちゃくちゃ, IPA: [petɕa kɯ̥tɕa], chit-chat) is a presentation style in which 20 slides are shown for 20 seconds each (6 minutes and 40 seconds in total). The format, which keeps presentations concise and fast-paced, powers multiple-speaker events called PechaKucha Nights (PKNs). 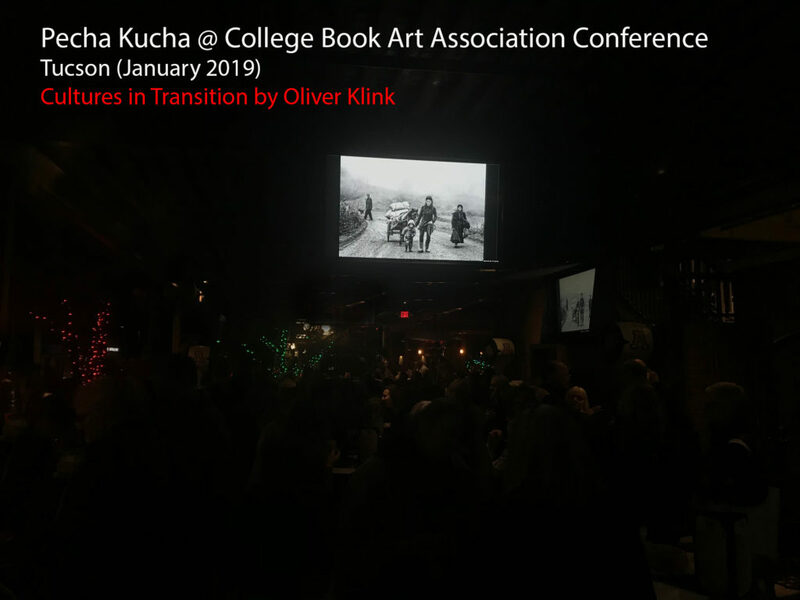 During the College Book Art Association conference, I was invited to present my project Cultures in Transition: Spirit-Heart-Soul. Cultures in Transition explores the changes that people go through, the subtleties that make their life evolve, their spiritual guiding light. In the past 15 years focusing on 5 Asian Countries, I observed the continuity between family, work, and spirituality. There was no separation. This Fluidity of life is at the core of Cultures in Transition. 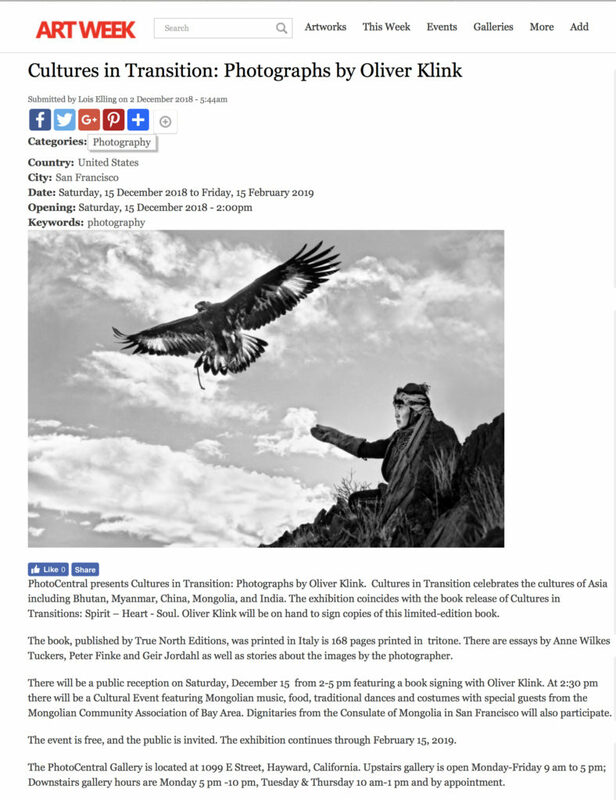 PhotoCentral presents Cultures in Transition: Photographs by Oliver Klink. Cultures in Transitioncelebrates the cultures of Asia including Bhutan, Myanmar, China, Mongolia, and India. The exhibition coincides with the book release of Cultures in Transitions: Spirit – Heart – Soul. Oliver Klink will be on hand to sign copies of this limited-edition book. The book, published by True North Editions, was printed in Italy is 168 pages printed in tritone. There are essays by Anne Wilkes Tuckers, Peter Finke and Geir Jordahl as well as stories about the images by the photographer. The PhotoCentral Gallery is located at 1099 E Street, Hayward, California. Upstairs gallery is open Monday-Friday 9 am to 5 pm; Downstairs gallery hours are Monday 5 pm -10 pm, Tuesday & Thursday 10 am-1 pm and by appointment. What is Critical Mass? The aim of Critical Mass is to provide participants with career-building opportunities and to promote the best emerging and mid-career artists working today. 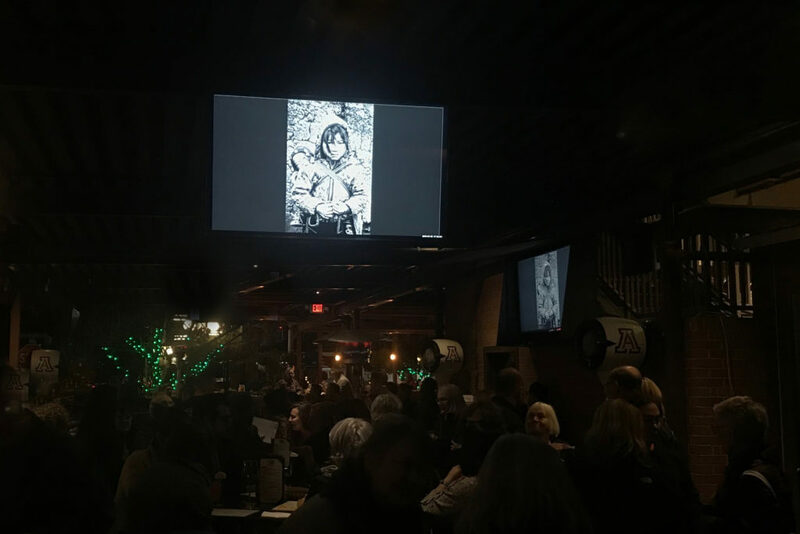 Critical Mass is about exposure, connection, and community – as well as some very notable awards! Photolucida is excited to once again offer our Critical Mass MFA Student Scholarship Awards this year. How is the selection done? Critical Mass gets photographers’ work in front of 200 top museum curators, gallerists, publishers, editors, and media producers. That’s a lot of eyes. As an individual photographer, it’s difficult to make connections with professionals at this level – much less with 200 of them. 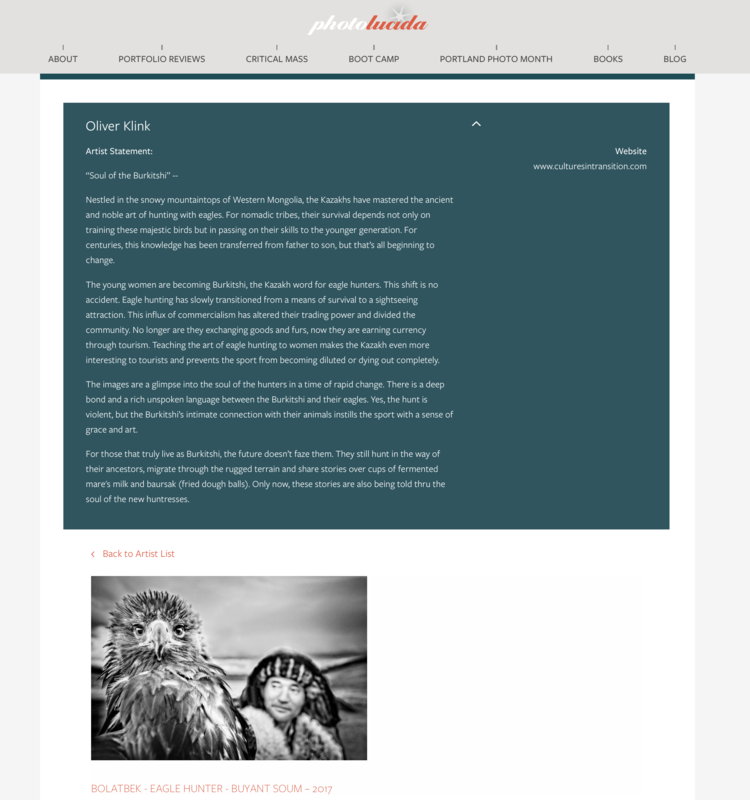 In Critical Mass, photographers (from anywhere) submit a 10-image portfolio. The 200 finalists who proceed past the first, pre-screening round then have their work reviewed and voted on by the full panel of 200 jurors. It’s an unprecedented way to get your work in front of the right people! Who are the jurors? Our Critical Mass jurors are an international group of industry professionals representing a wide variety of photographic interests. We make a great effort to invite a wide range of professionals in the field (gallery owners, agency art buyers, curators, publishers, editors, media producers, etc.). In addition to seeing the work during the online voting process, jurors also have access to a database of the finalists’ work for future reference. In 2016, I submitted the first chapter: The Spirit of the Village. Entering a village is stepping back in time. Narrow streets, sometimes paved, most of the time dirt paths. Un-numbered homes are the norm, as everybody knows each other. Streets wind in un-orderly fashion over streams of running water, sometimes fresh often as open sewage. Early morning feels like a metronome wakes up. Few words are exchange among neighbors, prayers and chores get on the way, people leave to go farming. Late afternoon, the center of the village gets busy as daily stories are shared over many types of beverages. People retreat to their home when darkness approaches. Description might be symbolic but the feel is pretty accurate. My interest was to capture the inner belly of the Village, what happens inside people’ homes, how they think, how they feel. Spirit of the Village is changing, mainly affected by the modern world innovation. Rapid changes often comes at the cost of old-world customs, rituals and social relationships. This is especially true in Asia, where a search for new opportunities in urban areas has led to a mass exodus of the middle generation in rural communities. Those left behind are balancing a growing tension between the cultural diversity of the past and the homogenized present. Villages are populated by those on opposite ends of the generational divide — grandparents and children. The net result often creates a situation where those desperately looking to preserve tradition are caring for those most-willing to embrace change. From a western perspective it may look like time stands still in the Village, and it some ways it does, but below the surface there exists a struggle between old and new, tradition and modernity that ultimately must come into balance as villagers hold onto their Spirit while coping with the reality of a modern world. In 2017, I entered the Heart of the Yi. For centuries, the Yi people have been surviving in the remote mountainous regions of China. In relative isolation, they have developed their own language, costumes and customs. Unfortunately, their detachment has also left them vulnerable to poverty, famine and the ever-encroaching reach of commercialism on their land. Exacerbated by the 2008 Sichuan earthquake, a disaster that killed 69,000 people, the Yi are struggling to rebuild their world as it has always been. Traveling deep in Yi territories is a trip back in time. The “last mile” is seldom as described, often restricted, but rewarding when you reach the “heart of the Yi” culture. The parents are hard at work, cultivating the land for subsistence. The young split their time between morning school, helping with daily chores, and taking care of their infant siblings. The nightly activities are basic as many of the homes have little to no electricity. But the lure of comfort in form of new homes and modern amenities has the Yi fiercely resists as they want to protect their homeland and authenticity. These images are a glimpse into the heart of the Yi. They showcase their daily joys and struggles not by embellishing them, but by showing them exactly as they are. Yes, their customs and way of life are antiquated, but their instinct of survival and resistance to change is commanding and full of hope. 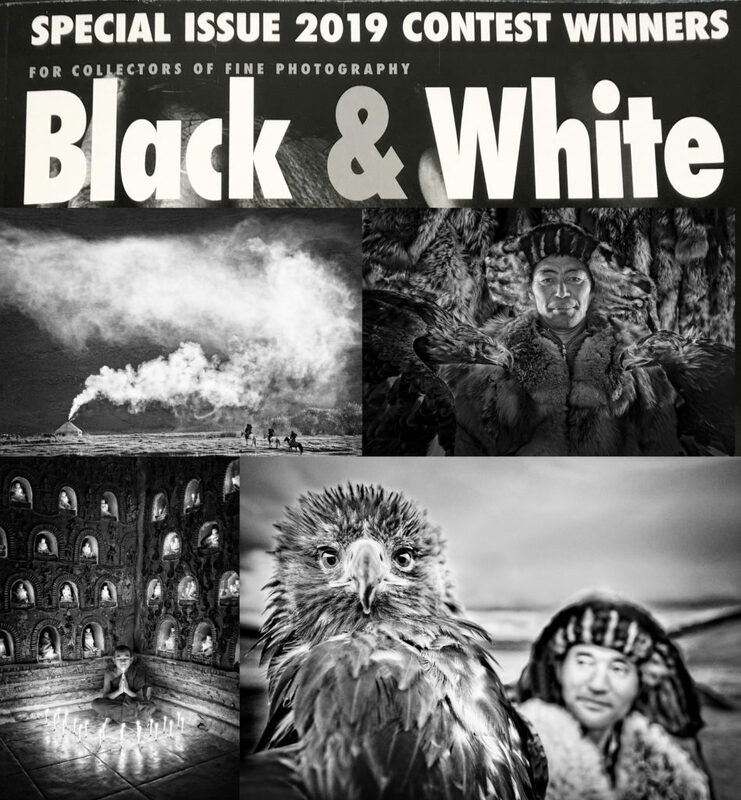 And in 2018, the entry was about the Soul of the Burkitshi, the eagle hunters of Mongolia. (see statement above). Don’t miss the opportunity to own all three body of works, with essays from Anne Wilkes Tucker, Peter Finke, Geir Jordahl, over 15,000 words detailing the journey (15 years) and the stories of all the people photographed. California photographer Oliver Klink lives a life of adventure and exploration, and, of course, photography. His camera acts as a sort of passport to some of the more exotic and remote regions of the planet, and his photographs show a world that most people will never see outside of the pages of National Geographic. Of the 112 countries he has visited, we will focus for now on just one; China, and in particular on a remote and mostly inaccessible ethnic group of people that most have probably never heard of and fewer still visited: the Yi of Southwest China. Galen Rowell once said that his legs got him into photography and they also got him to places where there were stunning photographs to be made. The same is true for Klink. As an avid skier growing up in Switzerland (he was on the national Swiss ski team), Klink’s physical aptitude and stamina got him to places in the Swiss Alps that were breathtaking, and it soon became apparent that he needed to chronicle these moments. On each subsequent trip, Klink’s explorations became even more rustic and further off the beaten path. It was only by visiting the region over and over that he started to lose his ‘tourist goggles’ as he calls them. He established trust, and began to focus on the true essence of the people; their daily joys, struggles, hopes, and fears of an uncertain future. China is developing at such an astonishing rate that even the most remote corners of China are subject to rapid modernization. “When you venture all the way down the road, says Klink, “Not just halfway, you can witness the histories and traditions of the people that are quickly disappearing from view, and from our planet. Klink’s approach to photography is very therapeutic for him. He tries to become one with the people he meets and then hopes his viewers will also connect with his subjects through his photographs. He tries to observe a lot and shoot little. It is not uncommon that he comes back with just a few ‘keepers” from three weeks of strenuous wandering in a foreign country. 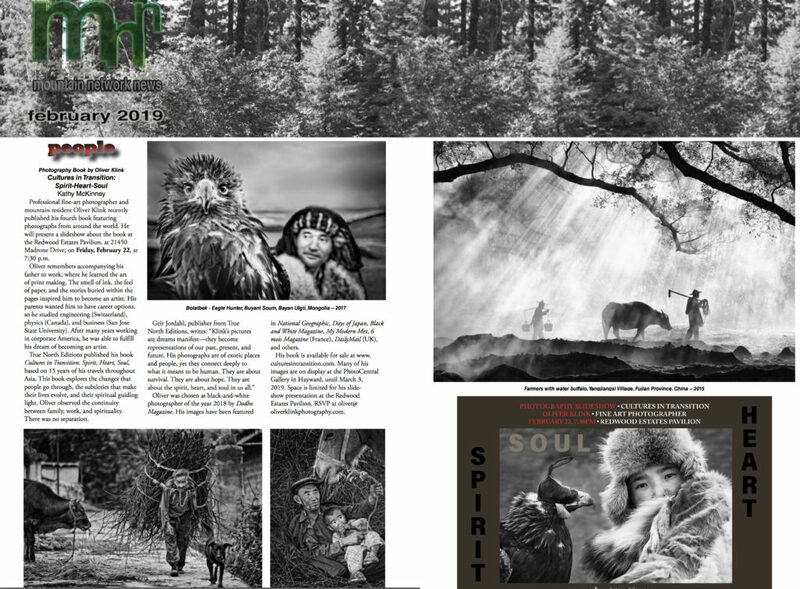 Images are part of a monograph, published by True North Editions, titled Cultures in Transition: Spirit, Heart, Soul.